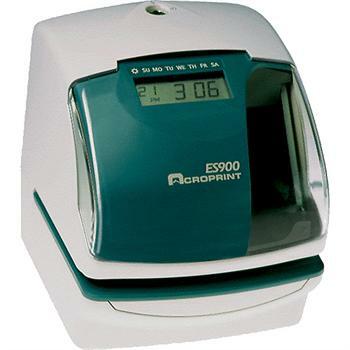 October 15, 2003 – Acroprint Time Recorder Co. introduces their new time tracking machine, the ES900. This eye-catching machine can perform as a Time Recorder, Time Stamp, and Numbering Machine. The ES900 has a large easy-to-read digital time display and is perfect for any office environment. The clock can easily be mounted on a wall or desktop. The ES900 features the new look of time recording equipment. The ES900 can print on either left or right hand margin of forms, which allows for easy card alignment. This clock makes it simple to keep track of employees' arrival and departure times. Time card editing is made easy by identifying early or late punches with Acroprint's I-Mark. The ES900 will never need resetting. The built-in back-up battery, the perpetual calendar and auto daylight saving adjustments will assure the clock will always have the correct time. The ES900 is very flexible offering over 300 selectable print formats, 1 to 6 digit consecutive numbering with repeats and 13 selectable preset messages or custom messaging available in 7 selectable languages. Clock has password protection, can use standard LH and RH time cards and handles all payroll periods. Some ideal functions of the ES900 are recording in and out times of personnel, equipment or document handling, and registering transactions. Optional features that are available for this time machine are signal control, that notifies start and stop times and slave clock configuration, receiving correction pulses from a master clock. February 28, 2008 - Acroprint announced that it would be discontinuing the production of the ES900 beige colored electronic time recorder and replacing it with the same clock in a new contemporary black and silver color scheme.